I need no sword, samurai. The wind, the rain, and the flame are my allies!" The magic of Rokugan is not merely a force to be conjured - each spell, each artifact, each bit of magic is alive with its own will and desires. These spirits call out to those blessed with the power of the shugenja, granting them the ability to control the elements. * New prestige classes, including the Jade magistrate and Master Smith. * New shugenja feats, including secret feats of the Great Clans. * Advanced rules for awakening the power with in a daisho - tha sacred swords of the samurai. * Over one hundred and fifty new sugenja spells. * New magic items and artifacts, including the Celestial Swords, the Bloodswords, and the infamous Twelve Black Scrolls. This book is designed to work as a supplement for Rokugan the d20 Companion for Legend of the Five Rings, or merely as a sourcebook of interesting new spells and items for your d20 campaign. Game Masters will need a copy of the Player's Handbook, the Dungeon Master's Guide, Oriental Adventures, and Rokugan. 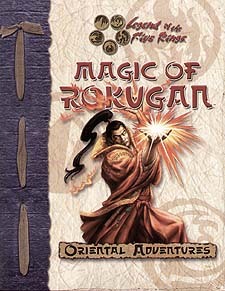 Players will need only the Player's Handbook, Oriental Adventures, and Rokugan. The magic of Rokugan awaits.